Currywurst: The Evolution Of Berlin's Popular Street Food : NPR FM Berlin Blog Molly Hannon explores the history of Currywurst, the on-the-go food that has survived and thrived for decades on the streets of Berlin. With a past woven both in times of struggle, and in times of rediscovery, currywurst popularity shows no signs of relenting. Though currywurst is simple street food, its gastronomical growth provides a window into Berlin's post-war mentality. Anthropologist Sydney Mintz once said, "The mystery of food taboos is a test case for exploring a culture's gustatory selectivity." 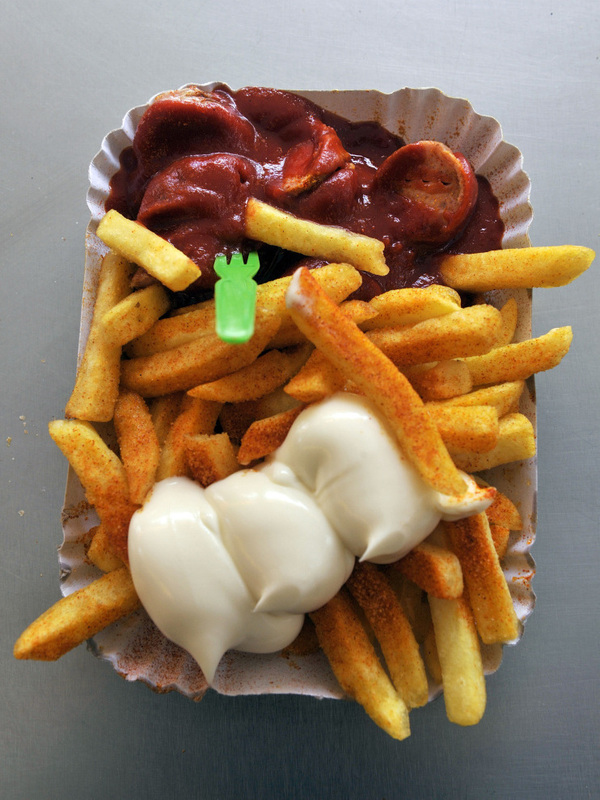 The traditional German street food known as "currywurst" provides such a case, allowing outside observers an opportunity to taste something unique, indulge in a little post-war history, and discover how the universal need for food can bind individuals and groups together. The currywurst's origins are attributed specifically to the German capital. In 1949, a resourceful German housewife, Herta Heuwer, traded some spirits with British soldiers for ketchup. The trade created the dish - composed of German sausage, or wurst, sliced and doused in ketchup and sprinkled with curry powder. An odd and unforeseen match, currywurst became an overnight success and eventually a staple, mainly amongst construction workers who valued its high protein content, hint of exotic flavor, and low cost. At first it maintained this function as a substitute for a poor man's steak, but soon it extended beyond the proletarian palate and became a popular meal amongst Berliners of all social apparati. This simple street food, with origins stemming from a combination of post-war hunger, resourcefulness, and openness to new flavors, may seem like a culinary contradiction in a city like Berlin, with its large sprawl of bio and organic markets and its renewed interest in supporting local agriculture. However, its simplicity, accessibility, low cost, and large following of movie stars, businessmen, and high-profile politicians, including Chancellor Angela Merkel, Gerhard Schröder and Berlin mayor Klaus Wowereit, reflects Berlin's egalitarian attitude towards food. Although it rivals New York City hot dog stands and carries the qualities of fast food, currywurst has managed to escape mass-manufacturing. There is no McCurrywurst, nor is each stand the same. The difference in taste is particularly evident whether you're in East or West Berlin. During the lifetime of the Berlin Wall, the East had no access to casing for the sausage, and, therefore, the currywurst in the East tended to be softer than its Western counterpart. Today, it remains the same. At its core, currywurst is a simple street food - something you can eat while standing up, on-the-go, or late at night after a few too many beers. However, its gastronomical growth remains its best ingredient, providing a window into Berlin's post-war mentality. Its ability to move beyond a terrible past, to embrace new flavors and make them its own, reflects a food culture that is both traditional and still evolving.